There’s just something magical in that sweet treat that also happens to include 1 of your 5 a day 😉 And when I was thinking of Easter recipes, this one came to my mind right away. 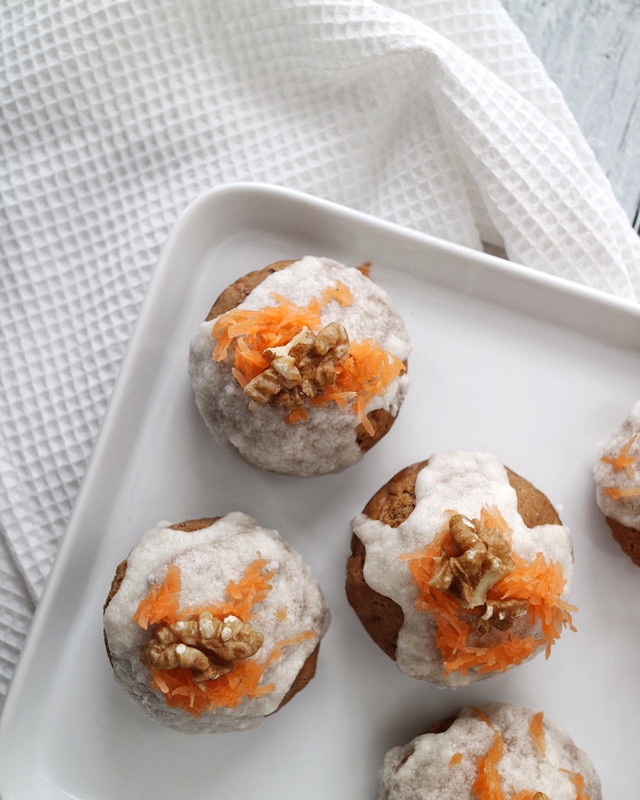 Though I do wonder how I’ve made the connection between Easter and Vegan Carrot Cake Muffins in my mind… after all it’s not the typical choice for Easter and I think it was most likely down to Easter bunnies and the carrots they eat… but hey: it’s a connection! Instead of creating an entire carrot cake (cause hey, we already got a recipe for that!) 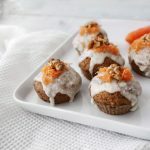 I chose to go with Vegan Carrot Cake Muffins this time – they’re the perfect bring-along foodie item to share with friends and family. I don’t know about your family, but for my parents it was always a tradition to visit family on Easter – or on the other hand to invite them to our house, so my Mum would pretty much spend a day in the kitchen to create delicious, festive bakes alongside a number of other delicious items, but let’s leave those for another time, shall we? Mix the coconut milk and the apple cider vinegar and set aside in the fridge to curdle. In the mean time blend the flax seeds and 3 tsp of water in a small bowl and also set this aside into the fridge. This will be your egg replacer in the recipe. Sieve the flour along with the baking powder and baking soda into a big bowl, then add the cinnamon and ginger powder. If you are using fresh ginger instead of the powdered version, make sure to only use a small amount and blend it into your wet ingredients for the recipe. In a separate small bowl combine the brown sugar with the vanilla extract and melted coconut oil and add it to the flour mixture. Also mix in the shredded carrots and blend well using a spatula. Grease a muffin tin with a little coconut oil, then equally divide your dough between 12 muffin holes. If you have greased the tin and are using a non-stick version (I bought mine at Lakeland) it is not necessary to use muffin lining – unless you absolutely want to of course!. Once the muffins come out of the oven, let them cool down completely before adding the topping. This is vital as the warmth of the muffins will otherwise keep your topping liquid and it will simply run down the sides of the muffins. Now onto the topping: Blend the melted coconut oil with the rest of the ingredients until you get a smooth and creamy texture. Make sure that the coconut oil is properly melted beforehand and that your mix is thick and not runny. If it’s too runny simply try adding a little more powdered sugar until a smooth but thick consistency is achieved. To get your topping onto the muffins you can simply use a large spoon to pour it over the individual muffins, or use a piping bag if you’re into making a pretty pattern – completely down to you! Feel free to decorate your carrot cake to your liking – my personal favourite is shredded carrot and walnuts, but shredded coconut it also very tasty! Leave the muffins out for the topping to dry completely until transferring to the fridge. And finally the most important part: enjoy!